Inequality is a central feature of life. Some individuals and organizations are always going to be more adaptive than others, and those folks should be unequally rewarded for their better strategies and solutions. Let too much societal inequality emerge though, and the rich will dismantle the government, change the laws to favor oligopolies, try to create a permanent upper and under-class, and entrepreneurs, the social contract, and the middle class get screwed. Get too little inequality, and you have no incentive for entrepreneurship and innovation—in short, a socialist hell where everyone gets screwed. Thus there’s a sweet spot, a particular range of political and economic inequality (think of CEO to average worker pay differences, or the difference between the income and assets of the top and bottom deciles of society), and the norms, rules and laws that facilitate that ideal level, and finding the sweet spot is a constant challenge. In a classic societal foresight cycle we can call the Plutocratic-Democratic Pendulum, Societies are always drifting out of fair competition into plutocracy, and periodically resetting themselves back to temporarily more democratic states. One pole represents a more equal, fairer competition, and pro-entrepreneurship society, what we will call a “Democracy”, and one a substantially less equal and innovation-oriented one, a “Plutocracy”. Swings between each pole occur often in history, and some swings take many decades to complete. Thus this cycle is of less interest to businesses, and more in longer-term policy and social foresight. 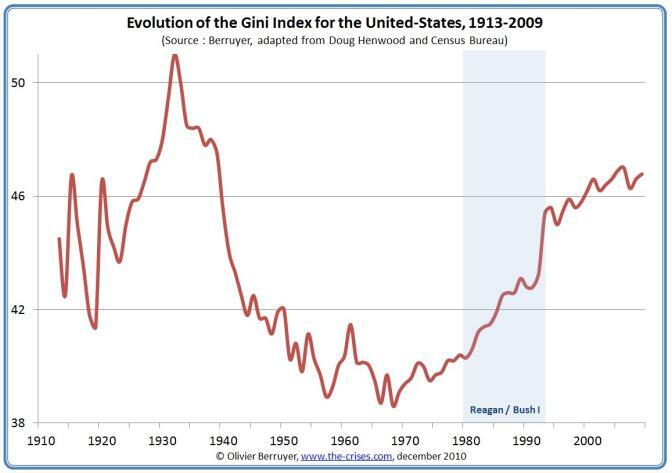 The figure below from Olivier Berruyer is a Gini index measure of US inequality since 1913. Note the high and rising inequality that existed for three decades prior to the Great Depression of 1930. Note also the nearly forty-year period of decreasing inequality from 1930 to 1968, through World War II and well beyond. Many new social programs and regulations emerged in this era. That Democratizing period has been followed by a forty-six year Plutocratizing period (so far) of increasing inequality, from 1968 to the present. Inequality grew particularly rapidly in the US in the deregulating Reagan and Bush I Presidencies, and under Margaret Thatcher in the UK. Inequality is high today in both countries, but still below the 1929 peak. When will our current US inequality peak, and after it does, how long will it stay peaked, and when can we expect another multi-decade Democratizing period, similar to 1930-1968? Social cycle theories are among our oldest models in sociology. Turchin in Historical Dynamics, (2003), and Korotayev in Introduction to Social Macrodynamics (2006) are two sources for good quantitative models of longstanding historical political-demographic cycles. Most of these models have been done with agrarian cultures. Oversimplifying, in the first stage of these cyclic models, population grows unchecked and there is overuse of the land via salinization from overirrigation, and soil degradation from overfarming. Food production declines, and control of production resources becomes increasingly concentrated in the hands of a few, and often bureaucratized. In the second stage, a demographic collapse (Malthusian catastrophe) occurs, with famine, death, and migration away from the overburdened regions. Then in a third stage, local resources again become temporarily more abundant, new enterprise and social renewal occurs, and then the cycle repeats. But while cycles of food availability continue in today’s technologically advanced societies they are now rarely the central drivers of social change. The new dominant cycles are economic wealth, produced by new technology, and the disruptions created as those new technologies work their way into all areas of society. Social cycles still apply, but the periodic catastrophes we now suffer are income and asset inequality cycles, market boom/bust cycles, and political corruption/reform cycles. The crises are no longer Malthusian (loss of life) they are temporary loss of financial wealth, cheap credit, affordable housing, fair wages, or political representation. What drives the social cycle in post-agrarian economies? One driver is what economist Adam Smith (and much less accurately, the utopian philosopher Karl Marx) called the Law of Accumulation, an observation that capital slowly but naturally concentrates with those who who start out, for whatever random reason, with more initial capital than their counterparts in economic transactions, as they are able to use their unequal wealth and power to do more with capital, generate higher margins and lower costs, and otherwise extract superior rates of return. In other words, real world markets (versus perfect, ideal, or “fair” markets) always eventually result in a crisis of overaccumulation, and a need for social redistribution. In 1968, sociologist Robert Merton also studied this natural cycle of accumulated financial wealth in modern societies. He called it the Matthew effect, the phenomenon where the rich tend to get richer, extracting ever better terms and unproductive rents in their economic transactions, and the middle class and poor get poorer, or at least, no richer. As Tyler Cowen notes in Average is Over (2013), we have seen the stagnation of average wages in the US for four decades now, while the top 15%, 10%, 5%, 1%, and especially 0.01% continue to accelerate in wealth. Network theorists call this kind of growth preferential attachment, and find it in many network-based natural systems. See Albert-Laszlo Barabasi’s Linked (2003) for details. But we see forces that work in oppostion to the law of accumulation in modern economies as well. One is a process the economist Joseph Schumpeter called creative destruction. Creative destruction is the economic condition where entrepreneurs and other small holders of capital can make better rates of return than large holders of capital, often for long time periods. For more, see Christensen’s The Innovator’s Dilemma (2011) and McKinsey partners Richard Foster and Sarah Kaplan’s Creative Destruction (2001). Creative destruction seems to need a special set of social and political conditions to make it more powerful than the law of accumulation. First, there needs to be the easy ability to be an entrepreneur, with no major legal or capital impediments to small business formation or operation. Second, there needs to be rapid change. Small companies always seem to learn and take risks faster than large companies in times of rapid change. Sometimes this change comes via sudden natural, social, economic or political events or catastrophes. But increasingly, rapid change comes from the continued acceleration of nano and info-driven technologies. Third, creative destruction grows whenever our technologies empower individuals and networks to learn, communicate, or experiment faster than hierarchies and large owners of capital. Think of personal computers, the web, and smartphones, and the way each has empowered entrepreneurship and disintermediation (removing layers of hierarchy) over large actors. Fortunately, these conditions are increasingly found in free societies in our modern era. See McCraw’s Prophet of Innovation (2010) for a detailed account of Schumpeter’s theories on how sufficiently rapid and powerful new technology waves spur new entrepreneurship, wealth turnover, and business extinction. When faced with sufficiently fast-changing and unfamiliar territory, wealthy investors and big firms cannot use cartels, collusion, and acquisitions to slow down innovation, and small firms grow more quickly to take market share. This dynamic is less true for high-capital industries, but as access to capital drops, with more crowdfunded, seed, angel, and venture capital available, even those industries open up to disruption as well. In our modern environment, the rush of new technologies can effectively stand in, at least for now, for the periodic political revolutions that used to be necessary to reverse the corruption and stagnation that comes with extreme plutocratic swings. Economic historian Walter Scheidel in The Great Leveller: Violence and the History of Inequality from the Stone Age, to the Twenty-First Century (2017), offers evidence that only rare and major system shocks, like pandemics, deeply economically damaging (“great”) depressions, mass warfare, and very powerful (and usually violent) social revolutions have caused reversals of inequality over the years. Creative economic destruction, and political reforms done within a plutocracy, often only slow inequality growth at best. Nevertheless, I would predict the emergence reasonably smart personal AIs, in every democracy by the 2030s, will be a system shock sufficiently powerful to cause our next great internal reversal (“democratic” reset). Furthermore, when we look outside of individual developing countries to the planet as a whole, we can see that increasing economic, technological, and cultural interdependence are increasingly taking us away from the violent and self-centered world that Sheidel aptly characterizes as our past. Because the size of the planet doesn’t get any larger, but our technological connectivity, interdependence, intelligence, and immunity continue to grow, we are rapidly moving toward a phase transition, where we are better described as one Global Superculture, and eventually Global Superorganism, rather than a collection of independent cultures. As Grinin and Korotayev explain in their masterful Great Divergence and Great Convergence (2015), national economies began a Great Divergence of income and power on Earth beginning as early as 1450CE in the West. This divergence, and the Rise of the West, accelerated as a variety of agrarian and industrial revolutions occurred in the centuries since. But since the rise of information technology aided forms of globalization in the 1960s and 1970s, we are now in a Great Convergence of national economies. Globally, we’re seeing a Rise of the Rest that that is progressively reducing inter-national inequalities. Many economists and historians argued strenously against this as late as ten years ago, as they document, but now nearly everyone is seeing this global economic megatrend. True, the 1% continue to diverge from the majority of us in most national economies. But now everyone is seeing the value of everyone being able to thrive, and the greatest development projects of the next two generations will continue to be raising the safety and standards of living of the poorest deciles among us. I personally am confident that the sim-aided democracy of the mid 21st century will be engaging in major redistribution, and constitutional amendments to greatly improve the social contract, and our sims will be citing evidence that if we care about innovation, and sustainability, we must reform all our industries and laws to keep them away from extreme inequality, both within nations and between nations, and to promote creative destruction. Thomas Friedman, in The Lexus and the Olive Tree (1999/2012), proposed a simple index of creative destruction. By counting, for example, the Top 10 private and public firms in each industry by market capitalization and noting how many remain in the Top 10 over the next decade, one has a simple measure of how much creative destruction is occurring. In countries like China, this number is low, as there is a lot of competition and turnover. In countries like Japan this number is high, as cartels of powerful families and corporations control many industries, reducing competition at the top. 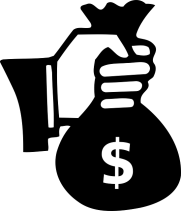 In some countries, like Israel, Japan, and Korea, a network of wealthy families run cartels that control many of the low innovation and domestic industries, and the higher innovation and export industries, like high-tech, remain competitive and subject to turnover. In the US, there is a medium amount of creative destruction. We have significantly less turnover than China, but much more than Japan. So one possible pendular model for the modern economic inequality cycle is that the law of accumulation drives societies to greater income inequality, economic overconcentration, and less competitiveness over time. Then some form of shock to this increasingly unstable system causes a reset. That shock might be a pandemic, mass mobilization war, a great depression, a social revolution, or most ideally, science, technology, and entrepreneurship-mediated creative destruction. Later, as the titans of the new industries grow up and consolidate their power, the system again gets increasingly overregulated, less competitive, fiscally overburdened, and ripe for deregulation again. Both governance states are adaptive under different environmental circumstances. Democracies offer freedom, innovation, and diversity; Plutocracies offer control, security, and scale. Societies swing irregularly between the two extremes. Both conditions are networks, but the term “network” popularly connotes a flat, scale-free structure and the term “hierarchy” a multi-layer, pyramidal structure, so it is common to refer to Democracy as a network, and Plutocracy as a hierarchy in social structure. For more, see my article, “The Political-Economic Pendulum” (2004). What is the appropriate level of creative destruction for an industry and a nation? Hopefully comparative data will help political economists answer that question better in coming years. 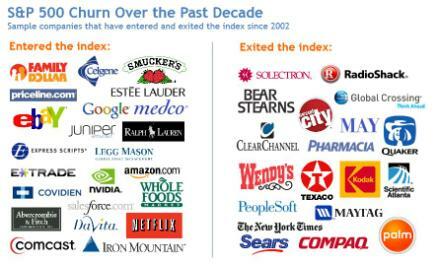 An Innosight briefing by Richard Kaplan, “Creative Destruction Whips through Corporate America” (2012), notes that 23 companies entered (and the same number exited) the S&P 500 index of the 500 most representative public companies, by market capitalization in the decade from 2002-2012. They also note that the average firm tenure on the S&P 500 was 61 years in 1958 and is now just 18 years, and if the current accelerating churn rate continues, 75% of the S&P 500 will be replaced by 2027. Because the S&P 500 is selected by committee to be top large firms that are most representative of the US economy, these numbers are much less impressive than if they were simply the 500 largest firms. But the above data at least suggests that the forces of accelerating technological change are keeping the US economy reasonably creatively destructive even during our current plutocratization swing. The pendular hypothesis would also predict that we’ll get even more competitive in the initial decades of the next democratization swingback, if and when it occurs. One interesting weak signal with respect to inequality cycles is that on a global level, as a single political-economic system, our species is already engaged in a swingback toward economic democracy. This concept is called global economic convergence, and long-term foresight thinkers should know the concept and its literature. In the last few decades, emerging nations’ economies have been growing faster in GDP than developed nations. We are seeing a “moderation of the West” and “a rise of the Rest”, as Fareed Zakaria says in The Post-American World 2.0 (2012). Very recently, we are also seeing both less inequality between countries (international inequality) and less inequality in global world citizen wages (mean-income convergence), the latter since 1988. A Great Healing of global income divides is now underway, even as most of the developed world’s nations continue to grow in their internal income inequality. The economist Branko Milanovic’s The Haves and the Have Nots (2010) and his paper, Global Income Inequality By the Numbers, Policy Research Working Paper, World Bank (2012) offer some of the most recent convergence data. Because of the finite size of our planetary sphere, and the accelerating digital intellligence of all the humans on that sphere, the world may be becoming a single regulated entity, something like a global organism. Global income convergence may be a weak signal of a permanent new shift toward the ethical noosphere (“global mind”) predicted by paleontologist priest Pierre Teilhard de Chardin in the 1920s, and explored in his utopian work The Phenomenon of Man (1955). See also David Brin’s The Transparent Society (1998), a brilliant exploration of how accelerating global digital transparency forces us to behave better toward others, in all spheres where we can be seen. Clearly there are cycles within cycles in all natural systems, and some cycles, particularly global and technological cycles, are more powerful than others. Seeing all the relevant trends and cycles and understanding their relative strengths, can help us greatly in predicting the future of any complex system. During Dwight Eisenhower’s admin (1953-1961), the top marginal tax rate for personal income for folks making above $200K/year (1.7M in 2015 dollars for an individual, $3.4M for a couple) was 91%. Basically, if you didn’t put your wealth back into production within a company, or otherwise shelter it in some publicly allowable scheme to create some value, the default was that you would give it back to society. Think about that for a minute. Even today, and especially today, with all our conveniences, who needs more wealth than $3M/year, if you aren’t going to do something productive with it? The foresighted policies that were in place at that time were not socialism, they were innovationism. They were generated by a government that cared about creating the best conditions for rapid social progress. Progressive tax schemes, and tax shelters intended to create social value are one key way to keep growing entrepreneurship, social goods, and technical capacity, and to keep our capitalist system fair and competitive. In my view, which I think is just common sense, it should be a good government’s job to incentivize folks to be productive with their wealth during their lives, and if they choose not do anything but consume, which is their right, to take back the majority of their excess wealth via progressive marginal tax rates, and when they die, via progressive estate taxes. We’re not talking 91%. Just the majority, let’s say, at least 51%. That kind of policy will give the most members of society the best opportunity for social advancement, and protect entrepreneurship and innovation. To not do this will inevitably create an increasingly rich (and idle) upper class who will dismantle the government, block economic competition and disenfranchise the masses any way they can. This observation, the Law of Accumulation, has been around in one form or another since Aristotle’s time. Eventually, plutocratic societies must hit some kind of democratic reset, or they become ineffectual and irrelevant. The data on all this will surely emerge from comparative political science and economics in coming years. For now, we just have our own good sense and historical examples. Today, the top marginal personal tax rate in 2015 is 39.6%, now well below a majority percentage. The US Federal Estate Tax was mostly eliminated under the Obama Administration, and estate taxes are being dismantled by the wealthy elites around the world. So we’re now on the wrong side of these issues, and our plutocracy is still getting worse, not better. Middle class Americans are seeing their jobs disappear, and haven’t had real wage increase in decades, and our children are graduating deep in debt from public universities we used to be able to attend for a very low cost. On a related note, our tax code could be much simpler and more concise, to make it easier for individuals and entrepreneurs to understand and comply with it, but it is also clear that a minimum complexity is needed for taxation to be a useful data source and regulator of the economy. Human behavior and social goals are complex, and thus our taxes, laws, and incentives also need to be complex. In complexity theory and one of its predecessors, cybernetics, this insight is called Ashby’s Law of Requisite Variety. A simple flat tax at the federal level is just a sly scheme by the rich to erode the oversight and usefulness of government. Unfortunately, today’s IRS is vastly less effective and understaffed than it used to be, and most tax shelters in US federal tax codes are no longer designed to advance social good. Applications for sheltering should be reviewed by government with social good in mind, the way nonprofit or social benefit corporation applications are reviewed. We’ve fallen a long way from this kind of innovation-first, democratic-first thinking, but we’ll eventually get it back. After all, this is a pendulum, right?